In light of the recent Seli 1 oil spill, WWF-South Africa has called on government to urgently enact the International Civil Liability Convention (CLC) and Fund Convention into domestic legislation as a measure to increase protection of vital marine resources. In light of the recent Seli 1 oil spill, WWF-South Africa (WWF-SA) calls on government to urgently enact the International Civil Liability Convention (CLC) and Fund Convention into domestic legislation as a measure to increase protection of vital marine resources. WWF-SA welcomes the swift response of Cape Town’s Disaster Management teams to clean the oil spill at Dolphin Beach, near Blouberg. Oil from the Seli 1 wreck began to leak last Friday, when rough sea conditions broke the ship into three parts. As a result of the oil spill, more than 100 endangered African penguins have been affected. “This latest oil spill recalls similar incidents off our coast, such as the Treasure Spill in 2000 which affected some 40 000 penguins, and reminds us of our vulnerability, as we are situated on a major shipping route,” explains Dr. Samantha Petersen, Senior Manager of WWF-SA’s Marine Programme. WWF calls on government to urgently enact the Conventions into domestic legislation. By doing so, it would allow the implementation of the Convention and give access to the funding should we need it. Without this level of protection, our fragile marine ecosystems remain in a precarious position. 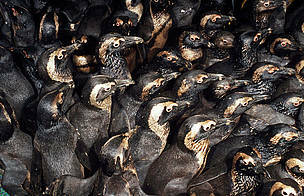 Oiled penguins in holding pens waiting to be cleaned after an oil spill.